I decided that 4th grade would be the perfect time to begin learning Latin with Curly. She’s had several years of Spanish and is making great progress learning vocabulary and basic grammar. So I felt that now was an appropriate time to introduce a study of Latin. However, I wanted to take it slowly since Spanish has been more of our focus. I looked at various options and finally settled on Song School Latin. Yes, Curly is older than the recommended age of early elementary for this curriculum. Yes, some of the aspects of the curriculum will be too easy for her. However, I felt like it was more important to have a fun and simple introduction to Latin for this year since our schedule is already fairly full. 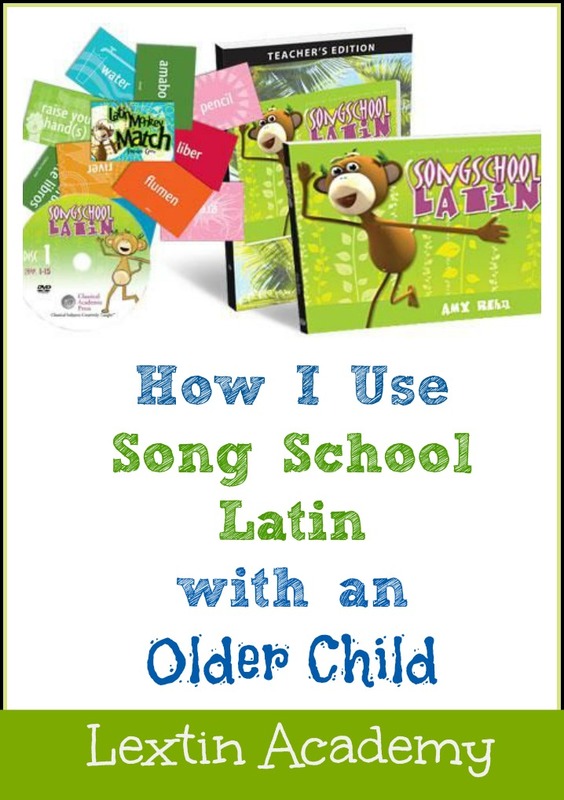 I chose Song School Latin because I liked the way that songs were incorporated to help remember the vocabulary words. I also liked that the lessons were short and simple with only a few vocabulary words or grammar concepts introduced in each lesson. I was also drawn to the idea that we would have videos that we could watch together (so I could learn too!). And lastly, I knew that the younger kids would enjoy the videos and songs and would probably pick up on quite a bit of Latin without even trying (and I was very right about that!). In using Song School Latin we complete two lessons per week. This means that Curly will complete the first book in the fall and then move into Song School Latin 2 for the spring. After that I plan to continue on with the books from Classical Academic Press and use Latin for Children. Every day we begin by watching the video for the lesson. We have a 4 day school week so on Monday and Tuesday we watch the same video and on Wednesday and Thursday we watch the video for the next lesson. Every video is watched twice which has really helped Curly’s retention. Then we do an exercise or two in the small workbook. And at the end of our lesson we go through a large section of the vocabulary cards and I drill her to make sure she doesn’t forget words from previous lessons. She then listens to the songs on her iPod while I work with another sibling. Our Latin lessons have been quick and easy. I’m very impressed with Curly’s retention of the Latin words. I’ve found this program to be a zero stress way to begin our Latin studies. The quality of the videos and even of the song CD is not exactly perfect. There are mistakes (that drive me a little crazy) but my kids don’t notice most of them. The workbook is not very indepth and is better for a younger student as the exercises are short and some don’t require writing – only drawing. This would be perfect for my smaller ones but Curly does find it easy (which is ok with me for this year). The younger kids enjoy watching the videos and listening to the songs, so they are effortlessly learning Latin words and phrases. The videos are nice because someone else is presenting the lesson. And my favorite part of the video is the derivative river which lists English, Spanish, and French words that are derived from Latin. Curly has learned so much vocabulary from this one small section! The flashcards are invaluable as they make it easy to have a daily review time of previously learned words. Overall, this program is easy to use which is why I chose it initially. I wanted to keep our first exposure to Latin very fun and simple and this program fit the bill. Even though Curly is moving very quickly through the program she is finding her study to be fun because she is not overwhelmed with the introduction to Latin while she also continues to study Spanish. I’ll be using this program over and over again as I use it later with the younger kids. So yes, I waited until Curly was older to begin our Latin studies. And yes, we are getting a very slow and gentle start. However, I have no regrets. Our Latin experience is fun and simple and we both want to continue our studies together.